Recently after re-watching a few scenes from Days, it made me wonder...what would Days be like if Xion didn't exist at all, and it instead focused solely on Roxas and Axel? First of all, as to whether I like Xion or not...I don't know, lmao. My feelings towards her are very conflicted. There are things about her that I like though, like the whole concept of looking different depending on who sees her, and her theme songs. I just don't want her to come back in KH3 like how would that even work. This isn't meant to be a hate thread, this is just a what-if I guess. So yeah, back to the topic, I started to think about what Days would be like if Xion never existed. Maybe the game could have focused more on Roxas's character development with trying to figure out who he is and why the Keyblade chose him? Maybe it could have had Roxas and Namine interact more? And maybe the Roxas v Riku fight could have been more like a final boss instead of just something to close the story (like AVN in DDD, it ended the story but he wasn't the final boss)? I'd love to hear what everyone thinks anyway. I feel like JUST removing Xion wouldn't be enough for a substantial change. Even more focus on Roxas' character? Please no. I reckon it would be even worse without her (unless, you know, it's actual development and not just, uh... enlarging what KH II laid out). I don't think Xion is the only/absolute "evil" of Days, nor that she's the source of all its problems. Perhaps I'd reach a compromise and propose to REDUCE Xion's presence in the game, and using the spare time to focus on other characters. Well.. theoretically Roxas would be able to use the Synch Blade technique throughout the whole game. He wouldn't have been forced to throw his Oblivion to Riku either . There is a fanfic called Inchoate Reflection in the fanfic subforum that does asks that question. The result is Xion's scenes are kept but Roxas is the one to act them out. Granted the fic is still in the early days so maybe the climax of the story has more substantial diferences. I don't mean to bash on any character, but I don't think it would've improved the story much. I strongly dislike Roxas in Days because for the most part it was watching a nagging kid grow up. He questioned the motives of the organisation but never enough to actually change his behavior - because he had, like he later pointed out, no other goal anyway, so the whole conflict was basically leading nowhere. I don't think Xion was the main problem in Days, but the writing in general. Days should've focused more on each organisation member like it did in the very beginning and I would've loved to get more interna. Did they have a family? Did they have individual goals, hobbys, struggles to overcome? What did the organisation members actually do the whole day? What separated Saix and Axel from each other? Maybe we could've played the days with the actual members to see them interact with Disney characters, each one in their own way and fighting style, that would've definitely helped to bring us closer to some of the lesser known characters (like Luxord). But back to the question: If Xion was removed, the actual conflict would be removed. Yes, there would still be that internal struggle of Roxas like "why am I here", "why can I wield the keyblade" but I don't think that would've been interesting enough to carry a whole game. Most arguments Roxas and Axel had were about Xion and Roxas' stubbornness to realize the situation, so without Xion they'd probably argued about other things, but not in that intensity. Maybe Roxas would've been mad at Axel for not telling him what he does in CO but again, that wouldn't be enough to carry the game. This doesn't mean that I think that inserting Xion was enough to carry the game because the writing mainly focused on ice cream, switching depressing moments between two depressed people and arguments that should've talked out but weren't. In my personal opinion Days should've been done with a totally different approach as I mentioned above. It would've been better, but to be an actually good game and story it would need more work than just removing her and calling it a day and keeping everything else more or less the same. Xion, in a sense, was a black hole on the story, pulling in everything and making everything about her inclusion. Just removing her but keeping everything more or less written the same doesn't really fix the heart of the issue since one of her biggest problems was how she influenced and changed the way everything else was structured and written. You would make the story a lot worse. Xion was a necessity because Roxas needed someone close enough to his situation he could bounce and grow off of. Which is what Xion mainly acts as and something Axel can't do because Axel isn't a kid. He's an adult who has lived at least 20 years and never had to deal with the problems Roxas faces. Xion brings a necessity, someone who he can work and grow up with together. If you dislike how Roxas is written alone that's exactly what you'd still be getting except you'd have more of it and Roxas would lack anything to give his issues focus. When you are writing a story about a kid growing up you need to have peers at their level, at or close to around their same level of social status and power. That give and take is an important element to writing a story about the birth, growing up, and formation of a person's self. Especially when you are starting with a blank slate, with someone who possess basic motor and speaking skills but for all intents and purposes has little to draw on. Not to mention the idea that she took away focus is honestly laughable. She has the least amount of screen time of the trio, she spends a good portion of the game asleep or off screen not really affecting anything. More often than not her problems are about Roxas not her or are extensions of issues faced with Roxas. Like when Xion runs away we aren't trying to get her back because that's good for her, we are trying to get her back for Roxas and Axel and their feelings on the matter superseded her's. In the end Roxas doesn't even leave the organization because of her. He leaves because of Axel and Sora, he leaves because knowing the organization can just create wielders put into question his own existence. You remove her and there is no logical reason that Roxas would throw away his friendship with Axel and risk his life suddenly without warning after being with the organization for over a year. At the very least you need the replica program and a way to connect that program to him and Sora in play to make his sudden spur of the moment leave make sense. You also wouldn't get anymore of the other members. Xemnas and Xigbar would still be saved for BBS and DDD with only small hints to tantalize them. The CoM members still would not really have any chance for screen time. The KH2 members still would largely be filler that only imparts stuff to Roxas on Disney world adventures. And Axel and Saix would still be the actual ones consuming the plot of Days, which is the real kicker here. Axel and Saix consume/make-up the plot of Days far more than Roxas and Xion do. The Days movie really nails that down as it's 90% Axel and Saix's plot with random Roxas and Xion cameos popping in to talk about their day/emotions. The game focuses almost entirely on Roxas, the movie focuses almost entirely on Axel and Saix, and Xion she struggles to have much if any screen time. I like Roxas but I think to better use the Organization it should have focused on Axel's time in the group. That's a good ten years and you could plot a more extensive arc where Lea tries to stay good but gives up under the weight of being in the Organization. Granted 10 years is a long time and you could easily meander on without a central threat. If you did an Axel post DDD where he sets out on a mission from Yen Sid and contemplates making amends that might have a stronger focus. Riku might have been a better lead because his desire to control his darkness could clash with what Diz is asking him to do. You also have the desperation of seeing his friend again, the desire to keep Sora's memory alive, him trying to turn over a new leaf because he screwed up in kH1, there is a lot to work with. It would be immediately better. But, frankly, the story of Days misses many opportunities so just "Days but Xion is gone" would still be a disappointment. What Days needed to do was give Riku, DiZ, Mickey and NaminÃ© larger roles. What are they doing for that whole year? What are the Organization doing in response? The Days we got has us chase after "an imposter" but never once does the Organization endeavor to find out who the imposter is exactly and who he's working for, if anyone. It feels like a lazy way to get Riku into the story. But the rest of the crew don't even get that much. Mickey is in the game for one (1) scene. Why did he separate from Riku? What has he been doing? How did DiZ transport Sora, Donald and Goofy from Castle Oblivion to Twilight Town? What happened inside the mansion that caused its destroyed appearance in KHII? There are too many questions that still remain from that time period, too many lost opportunities for this or that character to have their time to shine; in my opinion, Daysâ€‹ needs a complete rewrite. Xion was a necessity because Roxas needed someone close enough to his situation he could bounce and grow off of. Xion, from a narrative perspective, is literally Roxas. The newest recruit in a shady organization, who searches for the truth behind the Keyblade and their own identity. That she's a Replica almost feels like a cheeky way for them to say "yeah, we know." But that doesn't make it better. Even Riku Replica, who was a 1:1 copy, had a different character arc and place in the story from Riku. Xion didn't need Roxas to pursue those answers for herself. Likewise, Roxas does not need Xion. Besides that, Roxas was ostensibly a bystander for most of the story, with Xion progressing the narrative completely without his input or even knowledge. Xion is entirely redundant as a character and as an addition to this narrative. She is the embodiment of filler. It would be so much better. Roxas already has his friendship with Axel, Xion really didn't bring anything important to that dynamic. Without all the useless forced drama we could have had more time to get to know the other members, maybe even have some Roxas&Namine interaction that would have made KH2 ending make a bit more sense since they wouldn't be almost complete strangers. Xion isn't the only thing wrong with Days, but a big part of what made the plot such a huge wasted potential. Not to mention the idea that she took away focus is honestly laughable. She has the least amount of screen time of the trio, she spends a good portion of the game asleep or off screen not really affecting anything. Y'know, the first part about the screen time doesn't say much when 98% of the time she isn't around is still spent either talking about her or following events/situations that still have centrally to do with her, which makes the last bit almost laughable as Xion affected practically everything throughout Days. Even things that are at first glance not about her in some way are eventually twisted around to do include her in some manner. None of the characters had an agenda or scenario of his/her own that didn't involve Xion in some way, which is why I can understand Audo's assessment of Xion being the "black hole" of the story that draws everything in. Because of this every statement about "just removing Xion is not enough" hits the bullseye. In order for Days to work without Xion the "one-woman-spotlight-stealing-squad" the structure of the narrative would also need quite some tweaking and/or rewriting by itself. It wouldn't be immediately better without further adjustments due to the structure of Days essentially having everything revolving around Xion as a central angle like planets resolve around a star. Riku, DiZ, Mickey and NaminÃ© not receiving more coverage during Days was partly also a consequence of this, because their bits couldn't be tied any closer to Xion without totally crashing the story, even more than it already was by canon Days. It is somewhat irritating though I agree that the writers apparently had no idea/confidence to take up and build upon the open questions and possible exploration into other characters that were already there and instead had to bring in an entirely "new" scenario which pushes everything else aside in favor for essentially repeating the Clone Conga/Riku Replica-story just with a different colorisation (a female this time, but has to be another Kairi-clone, and with camouflage powers due to yet more memory-shenanigans, yay) and instigating yet another rehash of the "main trio" dynamic which wasn't possible with already existing NaminÃ© due to her not being with the Org and possible contradictions with already existing KH 2. Heh, as far as I've observed many fans who dislike Roxas' portrayal in Days do so not because of the "Zombie-like" empty toddler-"personality" of the beginning parts (these are logical and consistent with Rox not having any memories to start with) but because this beginning characterisation does not evolve eventually into the investigative (and partly aggressive) characterisation Roxas was already known for. There would have been hundreds of possibilities and opportunities for a more active and investigative Roxas to clash (mostly verbally and showing his more aggressive, forceful side) with different Organisation members throughout the whole narrative in his quest for answers, with Axel probably then being the one he trusts the most to a certain extent. Him eventually getting fed up and then after some especially big fallout (especially with Axel) finally deciding to leave completely could still have happened towards the end, possibly even due to subtle "propaganda" and nudging by "impostor" Riku from the sidelines or even NaminÃ© (that Mickey was kept away from Roxas like 100% is reasonable due to the Ven issue. Had Mickey get to actually see or meet Roxas before Re: Coded, BBS-shenanigans would have been needed to address). What people actually got though was indeed a "bystander"-Roxas who didn't really do anything beyond constantly whining about Xion as soon as she is introduced. The few development and evolution Roxas actually does show and get towards his more independent mindset are all squeezed into the last five days or so like that one telling scene in Agrabah which got removed from the movie version, and they manage to make even those somehow centered about Xion, including Deep Dive itself and the totally unneccessary bit of her being "present" in the Oblivion and asking Riku to do what he was about to do anyways. Even in scenes and events where she isn't present you can make a drinking game out of betting how long it takes for the topic to swing being about her in some form. Honestly I don't see why Namine couldn't have had a bigger focus. It's not me being like "oh I like Namine more than Xion". I just think it would have made more sense because a) Namine knows stuff about Roxas's past, and obviously Roxas would want to know more about it since he doesn't remember anything, and through their interactions he could grow as a person and realize that the Organization are using him for, and b) it would expand on their relationship established in KH2 and c) Nomura wanted Roxas to leave because of a girl anyway so it could still fit if Namine helped influence Roxas. I mean, Namine is free during most of Days, I'm sure that they would still be able to interact even if only very briefly. So could Riku (in the actual Days him and Xion interact with each other a few times). And there would still be a core trio (Roxas, Axel and Namine), it would just be handled differently. On one side, Roxas would be with Axel and maybe even the other Organization members, and sometimes Riku and Namine would see him in secret to slowly try and influence him to leave the Organization and rejoin Sora (which might end up creating another trio of Roxas, Riku and Namine). Which would eventually have Riku using force when things weren't going his way, thus starting Another Side. I saw the comment about Xion slowly making Roxas start to feel things and realize that the Organization were bad news, which I get. But I think Namine could have fulfilled that role as well. Maybe even her and Riku could have helped with that, like I said the three could have been considered a trio on their own, and I think it would have a been a far better way to reference the SRK trio than just having a Kairi lookalike. I don't hate Xion but like others have said, they already had existing characters that they could have developed more. Pretty much all Namine did in Days was talk to Xion about stuff (which kinda raises the point of the entire Days story being revolved around her). It would have been a better game, plot wise, had it focused on the already existing Organization XIII members, without a doubt. Xion is just stupid retcon drama. Except that's not true like at all. Xion is not a black hole and while she is involved with a number of events there is a huge difference between being present/being mentioned and being the thing that drives what goes on/the goal/the focus/etc... The black hole if you want to believe one is there, is Axel. EVERYTHING, every last smidge of that plot revolves around Axel even the disney stories that have nothing to do with Axel there is always Axel right there at the end to actually give shape and meaning to the knowledge to Roxas's experience there. Most of the A-story revolves around him and basically the entire B-story is strictly his, there is a C-story that mostly belongs to Riku and Namine but Axel manages to worm his way into the most poignant moments of that as well. The character with all the drive, with all the plot importance, with all the focus, and with all the agency and power is Axel. I have to honestly believe that is intentional because even key opening line of the game is a reference to Axel. "Light is made up of lots of different colors and Red is the one that travels the farthest" is a line foreshadowing that Axel is the star of this game/trio whose story will extend far beyond this. Even when it makes a motion to focus on Xion being missing in that opening scene it doesn't end on Roxas or her empty space, it ends on Axel looking distraught. And for a good portion of the game you're just waiting for the build up to that moment, to finally hear what Axel has to say. This isn't even an isolated incident either rather a representation of the trend. Axel was a big driving core in CoM, KH2 was re-written to hamfist Axel into a bigger role, Days was ultimately Axel's game told through Roxas's perspective, DDD Axel drove the majority of the B-story AND both Xehanort and Riku's big moments being ultimately hijacked and focus shifted to Axel. Heck in 0.2 while Axel isn't there he's brought up as going to work with Kairi and it's all about how Axel has changed and Kairi's feelings are treated practically as an afterthought as they deliberately focus on the faces of everyone but kairi. Can't forget that originally the hooded figure in Coded that drove the important plot that happens in CO was also going to be Axel, but at least they decide to for once not give all the bones to Axel. Axel is the black hole of the series as a whole honestly. To be fair, the series is full of bad writing. It's got bigger issues in the plot department than just one unnecessary filler character gradually being given too much importance. I love Kingdom Hearts, but Nomura writes fan fiction tier material. You're right, there is a difference. And in Xion's case, she's both. Now that is just blatantly false. 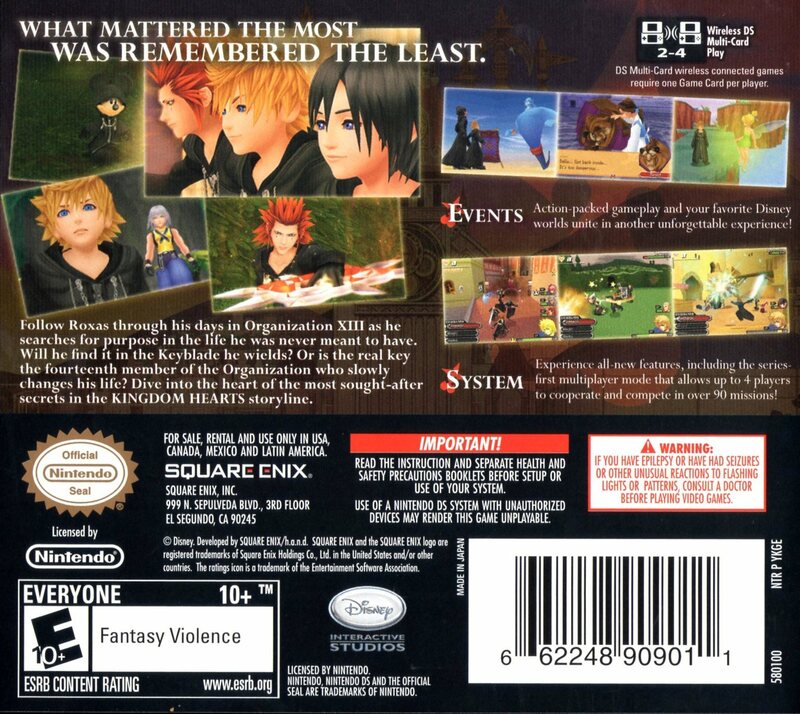 You can tell even from the back of the box how much the story is wrapped around Xion. It's almost laughable how much you're trying to push Axel as the "black hole of Kingdom Hearts." Seems to me that you just don't like him and are upset he's become something of a main character. While it's true that Axel has more screentime than Xion, you can't ignore how many of the scenes without Xion are either about her, directly influenced by her actions or have characters explicitly mentioning her in relation to the focus of the scene. Xion is the Poochie of Kingdom Hearts. "Whenever Xion's not on screen, all the other characters should be asking 'where's Xion?'" No, he wasn't. He actually has very little to do with those events. It should be obvious that NaminÃ© is the driving force of CoM's narrative. I can't find a single thing to support this statement, and it's the first time I've ever heard of it. I disagree with the notion that Axel was the black hole of Days. He was a main character with an established friendship with Roxas so of course he was going to be there. Xion has way more influence in the overall story since she's connected to Roxas and Sora, she influenced Roxas to leave the Organization, she was the source of the conflict most of the time, etc. And Axel and Saix's fight was just in the background, it had nothing to do with the main plot regarding Roxas and Xion. The whole game wasn't about how they were fighting and such. The game focused heavily on Xion way more than Axel. The title itself (three five eight days over two) refers to both Roxas and Xion, not Axel. If Xion never existed, the other Organization XIII members would have been more fleshed out. We would have found out more about Axel, Saix and Xigbar. i already asked that in a different thread . Part of it is she is tasked with retrieving Sora's memories so her role is stationery. She doesn't work with the organization so she wouldn't have as much chances to meet with him. And Roxas doesn't believe in anything greater than himself so namine telling him he comes from Sora and should return to him wouldn't work (and really didn't till the very end). I don't think Xion is entirely to blame for that, but it really would have been nice to actually know more about the other members. I think more screen-time for them in general would have been nice. QAQ Even if we didn't get any backstory, it would have been nice to actually see them interact. I still think that there could have been mental contact somehow even if she wasn't there in person, and then eventually he would see her in person, maybe in the White Room in Twilight Town or something. And yeah, I know he wouldn't ever rejoin Sora. The scenario I thought up was that Roxas leaves to find Namine (that scene with Axel where he said that no one would miss him), then he would meet Namine in person and she'd tell him that he had to rejoin Sora to stop the Organization, but he'd refuse and take care of it himself, and then once he goes to fight them himself, Riku stops him. Maybe this would have been worse than what we got, I just think Xion could have been replaced by Namine even if she isn't physically there most of the time.